She was one of the women at the centre of the Cervical Check scandal. ONE OF THE women at the centre of the Cervical Check scandal has died. Emma Mhic Mhathúna passed away at the age of 37 in Kerry this morning. Mhic Mhathúna was diagnosed with cervical cancer in 2016, three years after a smear test result incorrectly came back as normal. She had been receiving treatment at University Hospital Kerry prior to her passing. She passed away surrounded by her family. She was a mother of five. “Emma Mhic Mhathúna, a wonderful mother, daughter and cherished friend passed this morning. Emma, who battled her illness with great valour, passed away peacefully in the comfort of her family’s loving embrace in the knowledge that she had helped to shine a light on important issues which affected not just her own life, but lives of many others. Emma’s unending and unwavering commitment to her children means that her abiding legacy will be that of a great mother. However, Emma will also be remembered as someone who fought for social justice in an exceptionally selfless way during times of great personal challenge. We will miss Emma beyond words, her intellect, her love, her quick wit and infectious smile are irreplaceable to those closest to her in these difficult days. However, we take some comfort in the knowledge that Emma will be long remembered by the thousands of people who have been inspired by her fight for justice, transparency and improved services. Tributes have been coming in for the campaigner. Fellow campaigner Vicky Phelan said that Mhic Mahthuna’s legacy will be one of strength and courage. Speaking on RTÉ Radio One she said: “I’m not often lost for words, it’s very upsetting. I suppose in my case I’m still dealing with illness but I really thought she had a few more months. I didn’t think she was as bad as she was. The passing of Emma Mhic Mhathúna is heart breaking to hear. Her bravery was an example to us all, and will save many lives in coming years. Deepest condolences to Emma’s family & friends. Earlier this year, Mhic Mhathúna settled a €7.5 million settlement with the HSE over her incorrect smear test results. She had launched legal action against the HSE and Quest Diagnostics, the US-based company that analysed her smear test results. While €1.1 million was granted immediately to Mhic Mhathúna to buy a family home in Kerry and to go on a family holiday, the rest was to be put aside in a fund for her children. Taoiseach Leo Varadkar extended his condolences to the campaigner’s family and friends. He said: “I extend my heartfelt sympathy to Emma’s family and friends and especially her children. In her life, Emma did us all a huge service with her advocacy for the HPV vaccine. “Despite her own tragic experience, she consistently supported the screening programme and encouraged women to continue engaging with the service. “I am determined that something positive should come from this tragedy, and it’s my objective to virtually eliminate cervical cancer in Ireland. The HSE has, this evening, issued a statement regarding the death of Mhic Mhathúna. It said it was very saddened to hear of her “untimely death”. “Throughout the Summer, Emma’s steadfast courage and advocacy in the face of a terrible prognosis was central in the establishment of the Scally Review. “The 50 recommendations from the Scally Review will undoubtedly improve the quality of Cervical Screening in this country into the future. “Emma remained in close contact with the HSE over the past number of months in order to receive briefings on improvements taking place in Cervical screening. 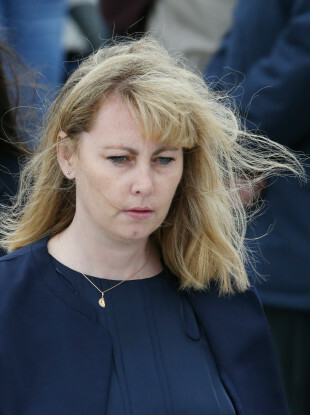 Email “'We will miss her beyond words': Cervical Check campaigner Emma Mhic Mhathúna dies aged 37”. Feedback on “'We will miss her beyond words': Cervical Check campaigner Emma Mhic Mhathúna dies aged 37”.